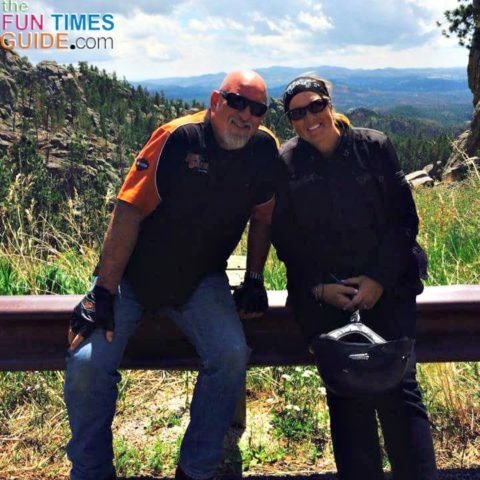 My husband and I are frequent long-distance motorcyclists. He drives, I ride …and take pictures. This was a big deal for us. 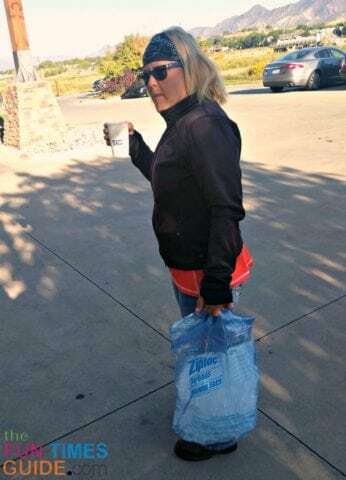 For me… because I have always prided myself at being a master at minimalist packing on all of our motorcycle trips. Yep, I actually like the challenge of trying to pack exactly the right type and number of clothes to be self-sustaining for 2 to 6 weeks on a motorcycle. Here’s my minimalist motorcycle packing checklist. For hubby… because has said for years that even though lots of our friends were buying pull-behind motorcycle trailers, he just wasn’t interested. Harder to park – you always have to find bigger parking spaces, ideally not on a slope, and easy to pull straight out of. Difficult to back up – which means you have to pay a lot more attention to how and where you park the motorcycle. 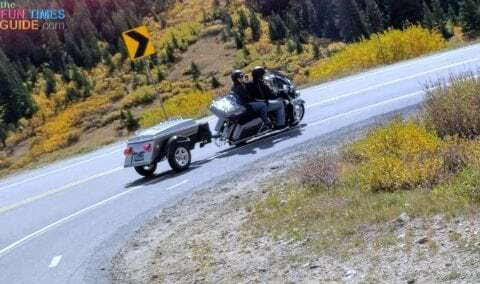 Another thing to think about when you’re riding – especially when riding on curvy roads, riding on highways where cars are passing and they don’t always think to look if there’s a trailer behind the motorcycle or not. At the encouragement of our friends who absolutely love their pull-behind motorcycle trailer, we all decided on a whim one afternoon to drive to Murray, Kentucky together — to see what type of trailers Hannigan Motorsports had in stock. Like usual… we swore that were “just” gonna look. 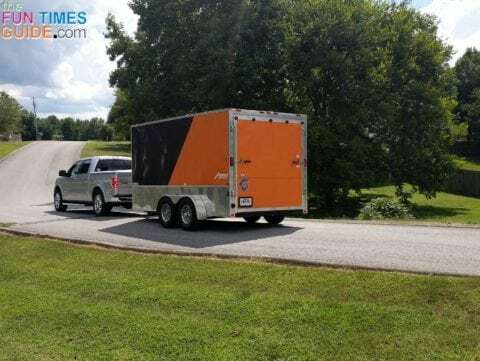 But we actually drove away with a new trailer that day! 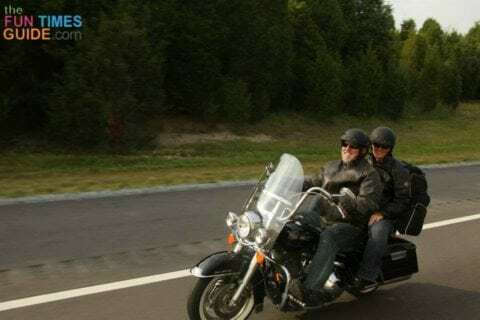 Had we known we were going to buy a pull-behind motorcycle trailer, we would have definitely ridden our motorcycle there instead. 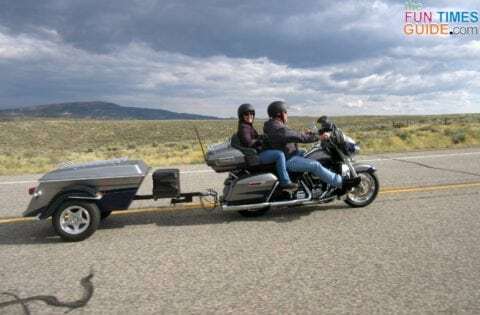 Now that we’ve used it a few times, hubby and I both agree that the pros far outweigh the cons when it comes to buying a motorcycle trailer. It’s not harder to park — you just have to think ahead a little bit when scouting out parking spots. 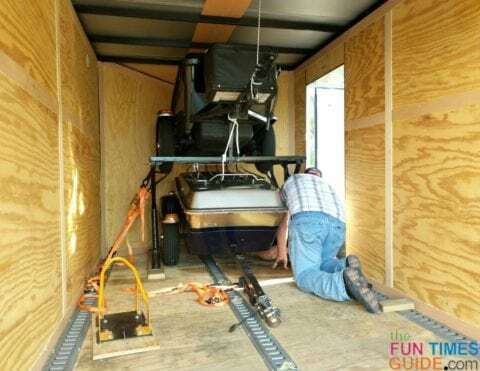 It’s not all that difficult to back up — you just have to practice a little bit ahead of time until you feel comfortable with the process of backing up a trailer. 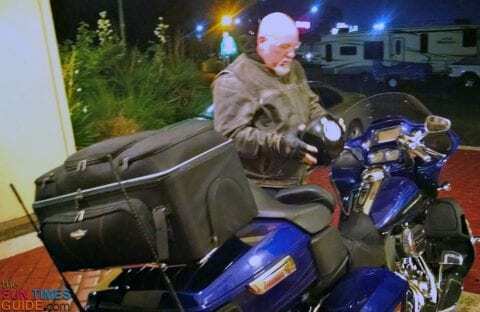 It’s now possible for us to pack some of the “extras” that we would typically leave behind — like chaps, leather jackets, full-face helmets (for rain and cold weather). 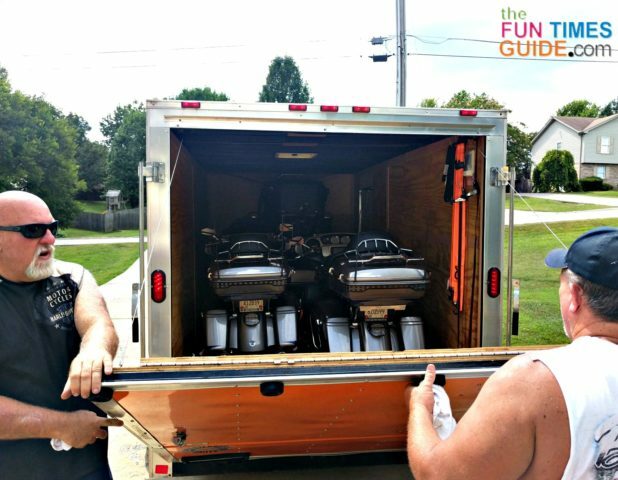 It’s easier to load and unload a motorcycle trailer than it is to securely strap down motorcycle luggage onto the motorcycle itself (actually, the tour pack). And when you’re traveling for weeks — or months — at a time, that’s not a task that you look forward to every morning! We’ll be able to save money by camping sometimes, rather than staying at hotels all the time. Granted, we don’t have a good track record with camping. (We strapped a small tent and sleeping bags on the motorcycle with us one year, only to be bug bitten, sweaty, cramped, and suffering from lack of sleep after lying on the hard ground all night. The next morning, we went to a UPS Store and shipped all of our camping stuff back home and we enjoyed cheap hotels for the rest of the trip!) But with the extra space, we can pack sleeping mats, a bigger tent, and we’ll have the cooler for added enjoyment — and adult beverages. The cooler attachment is one of our favorite things — because having access to cold drinks and a way to keep snacks from melting in hot weather is a really nice luxury! 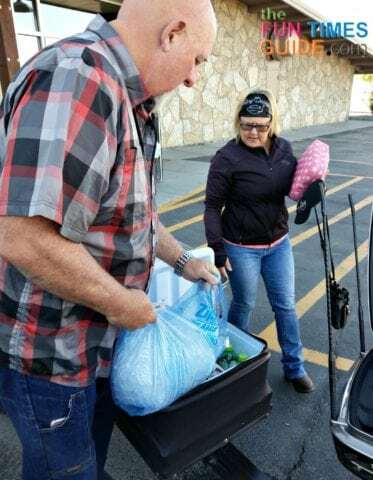 Now we start each day by filling up our heavy-duty Ziploc Big Bags with ice from the hotel each morning, adding cold drinks & filling snacks to the cooler at our first gas stop, and skipping lunch altogether. As a result, we eat fewer “full meals” than we used to, and we enjoy our dinners much more once we reach the hotel in the evening. 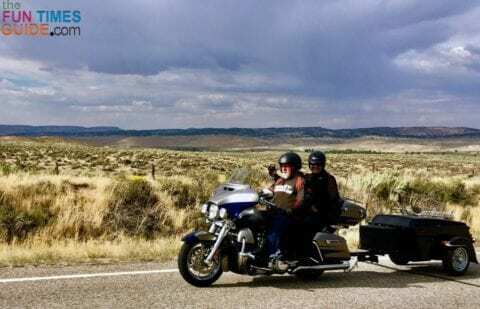 This was also the trip that we gave in to the fact that it made more sense to use an enclosed motorcycle trailer to tote our bike & trailer (and our friends’ bike & trailer) from Nashville, Tennessee to Fort Collins, Colorado to start our trip out west — rather than ride the bikes out there and lose 4 to 5 days driving through the boring parts of Missouri, Kansas, and Nebraska each way. 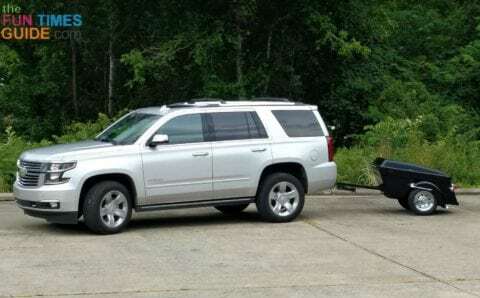 Up til now, hubby had always said, “Trailers are for boats!” Together we’d roll our eyes in unison any time we saw a car or truck towing a motorcycle in or on a trailer behind it. 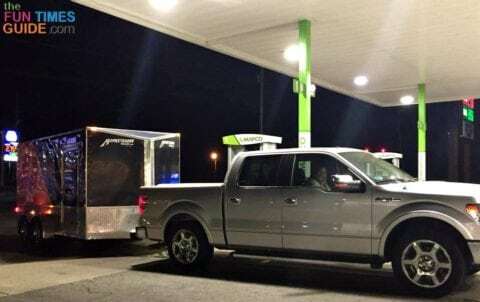 However, for maximum fun from our 2-week trip, we decided to shave off those boring parts of the trip by attaching our friends’ Homesteader Patriot enclosed motorcycle trailer to our Ford F-150 pickup truck — and sharing the driving. 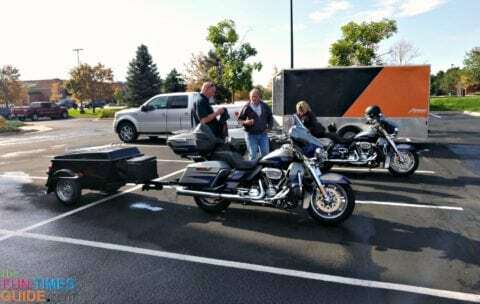 We are thrilled to have such good friends to travel with and these amazing motorcycle trailers to get us everywhere we want to go safely. 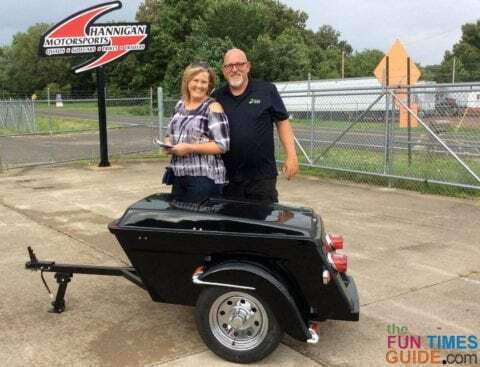 Kevin did a ton of customization to the enclosed motorcycle trailer — to make sure the bikes, trailers, and coolers didn’t budge during our trip! The guys did all of the wiring for the trailer lights themselves (on the enclosed trailer and our new pull-behind trailer), and they added the cooler attachment & luggage rack to our pull-behind trailer. 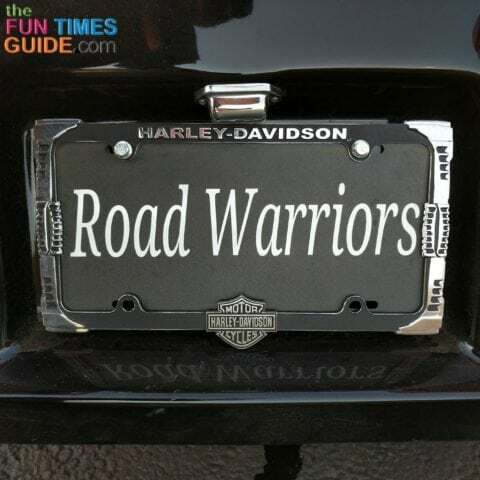 The only thing I did was add the personalized license plate for the back of our pull-behind motorcycle trailer. 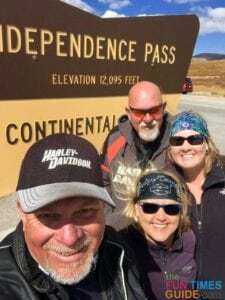 (Kevin and Kay have always called us the Road Warriors from all the cross-country motorcycle trips we take… so we went with it and chose that for our personalized license plate.) I got it from Build A Sign. 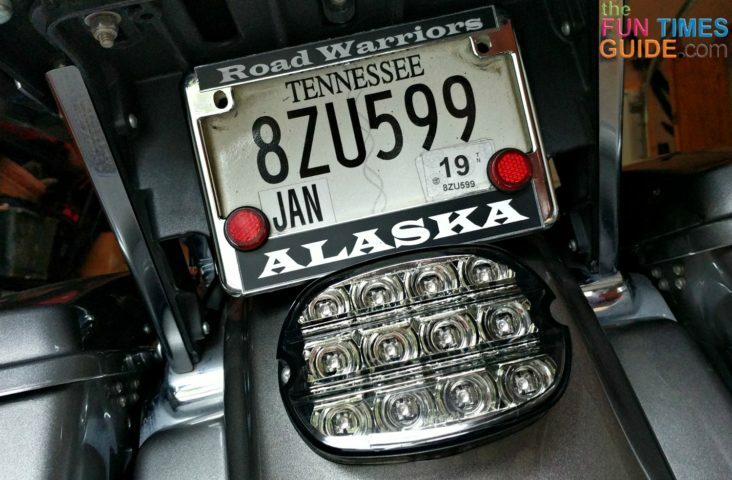 Then, I made a coordinating personalized license plate frame for our actual motorcycle tag. (I put Road Warriors on the top and ALASKA on the bottom — that was one of our most memorable long-distance trips and I wanted to remember it every time I got on the bike.) I got it from Best License Plate Frames. The bottom line is… good friends + good times = good memories!